Yesterday when Husband asked what I wanted to do today, I answered, without hesitation, "Learn something". I surprised even myself. So today, after a mega kitchen-cleaning, I tackled two brand new (to me) recipes. The actual results will come later on this week once I've had a chance to go through the zillions of photos I took through the process (learning photography while learning to cook: super fun, but ridiculously time-consuming), but I thought I'd share a quick tip that helped me today. I actually learned this trick from my dad years ago, and while I haven't needed it in at least a decade, it came to me today in a flash as I gazed down at my (mistakenly purchased) raw hazelnuts, and I was so glad to have remembered. 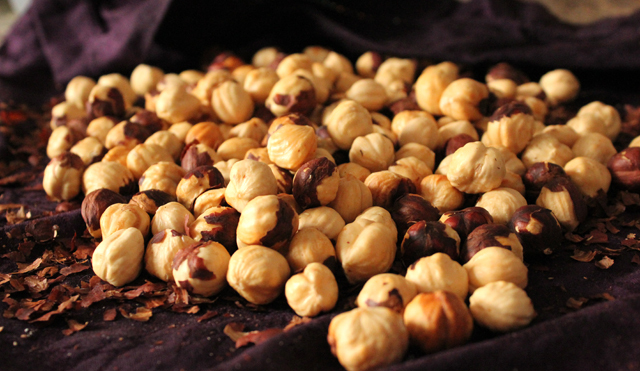 You roast the nuts without any fanfare, on a tray in the oven, but then magic lies in a damp cloth. When the hazelnuts come out of the oven, and the skin is all crackly, toss them in the wet cloth and roll them around in there. 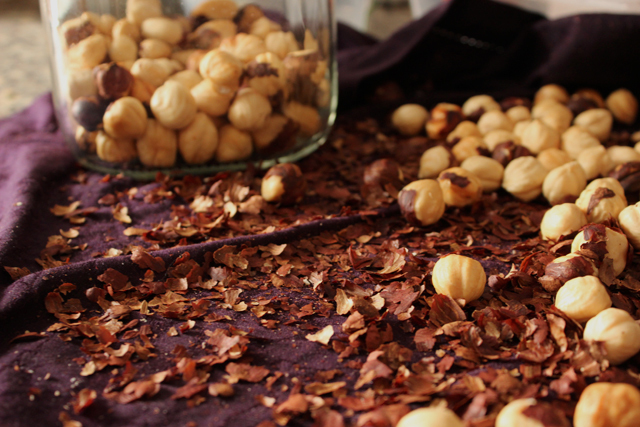 The dried skin will just flake off and stick to the fabric, and you will be left with beautiful delicious naked hazelnuts. Magic! a few more photos (because I can't help myself) over at Dragon's Palate.